From Hoosiers to Blindsided, there's just something about a feel good sports movie that everyone loves, isn't there? I'm not even a fan of sports myself, and yet I find myself being drawn into these great stories...working together, overcoming hardships, these are stories and lessons anyone can appreciate. Inspired by a true story, When The Game Stands Tall tells the remarkable journey of legendary football coach Bob Ladouceur, who took the De Le Salle High School Spartans from mediocre to outstanding, including an incredible 151-game winning streak that shattered all records for any American sport. When tragedy strikes though, they must decide if the sacrifice, commitment and teamwork they have always trusted can rebuild what is now disintegrating around them. The story may be about a winning team rather than an underdog, but it still has everything a good inspirational sports film needs. They learn what it means to be a team- to work together, to overcome adversity and most importantly, they learn that it's truly not all about winning. It is not just a story about a team who wins, but a story of growing up. For any sports fan, it's a must watch...and for any non-sports fan like myself...it's still a must watch. It truly is a great story that goes far beyond football. And a great story that everyone CAN watch... like many of the other great movies from Affirm Films, this is a movie that you can feel confident in your whole family enjoying together! It's another perfect addition to your family movie library! When The Games Stands Tall is available now on Bluray and DVD. Want to check it out for yourself? You can purchase at Family Christian stores everywhere! 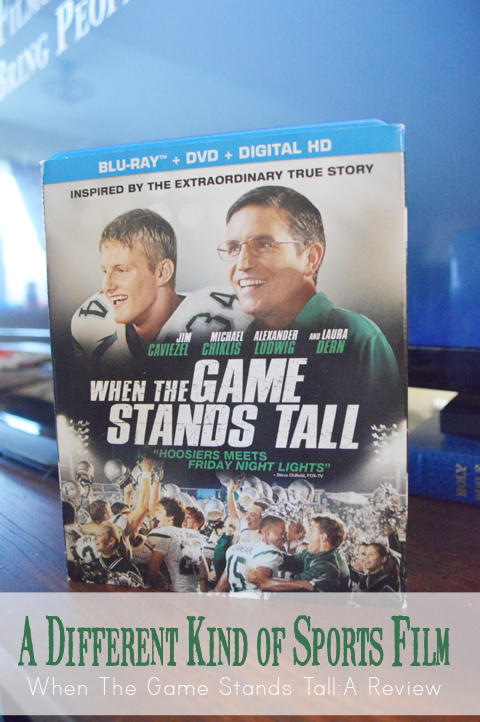 Have you watched When The Games Stands Tall? What did you think? Who in your life would enjoy this film? I just saw a preview for this movie today. My fiancé was crying watching the preview! We are pretty sappy people....but shhhh, we don't tell people that! Anyway, this movie looks really good and we both agreed we will need to watch it soon!